In Our Society, Is it Possible to Experience Equality and Justice? • The volume comprises twenty two (22) academic articles in English and has 336 pages. It contains studies and papers which, for the most past, were presented at International Conferences of Philosophy of i) the International Association of Greek Philosophy (IAGP) and ii) the International Center of Greek Philosophy and Culture (ICGPC). The papers were subsequently revised by the authors and are now being electronically published by Ionia Publications in Athens, 2015. 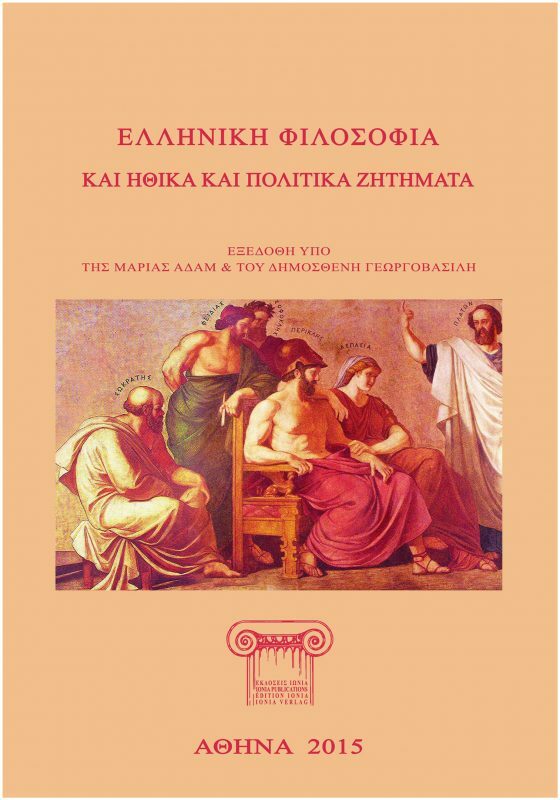 Ionia Publications is the printing section of the INTERNATIONAL ASSOCIATION OF GREEK PHILOSOPHY. • In these papers, which are grouped under the general title Greek Philosophy and Moral and Political Issues, one will find reflections on central problems of our times, mainly on moral and political issues in Greek philosophy, from scholars around the globe representing different points of view and different cultural traditions. • This collection of academic articles constitutes an essential acquisition for every specialist in the field and for every library. Οι μελέτες στον παρόντα τόμο αναφέρονται σε θέματα τα οποία βέβαια μπορούν να υπαχθούν υπό γενικό τίτλο:ΕΛΛΗΝΙΚΗ ΦΙΛΟΣΟΦΙΑ ΚΑΙ ΗΘΙΚΑ ΚΑΙ ΠΟΛΙΤΙΚΑ ΖΗΤΗΜΑΤΑ. This electronic volume includes eleven (11) academic articles in Greek and has 150 pages. It is an essential acquisition for every specialist in the field and for every Library. • Each volume costs € 20 (euros or equivalent). • A collective order of 3 volumes costs € 40 (euros or equivalent). • A collective order of 2 volumes costs € 30 (euros or equivalent). • If readers need to have a hard copy text, they can simply print the relevant text by adjusting the scale to printer margins. In this way they may have off-prints. • H οικονομική κρίση που ξέσπασε και έπληξε κυρίως τις πολιτιστικές και επιστημονικές δραστηριότητες δεν επέτρεψε να εκδοθούν οι εν λόγω Ανακοινώσεις σε έντυπη μορφή. Όμως, εάν οι συγγραφείς ή οποιοιδήποτε άλλοι επιθυμούν ή χρειάζεται να έχουν ένα τυπωμένο βιβλίο, μπορούν να τυπώσουν σε χαρτί Α4 το ηλεκτρονικό κείμενο, ρυθμίζοντας κατάλληλα τα περιθώρια του εκτυπωτή τους. Κατά τον ίδιο τρόπο μπορούν να εκτυπώσουν και να έχουν όσα ανάτυπα επιθυμούν. • Concerning payments please note that the transfer of any kind of funds is much easier if you (or your Institution) arrange a bank transfer (through Internet banking) directly to our account. We know that through Internet banking the bank charges are very limited.